Metalformers must be confident that the machines they’re buying will stand up to the materials they’re tasked with stamping today, and in the future. That’s the message coming loud and clear from suppliers of pressroom equipment in light of the onslaught of challenging metal alloys making their way into metalforming plants. Of primary concern are the numerous advanced high-strength steels (AHSS) that for several years have been mainstays in Tier One and OEM stamping facilities. 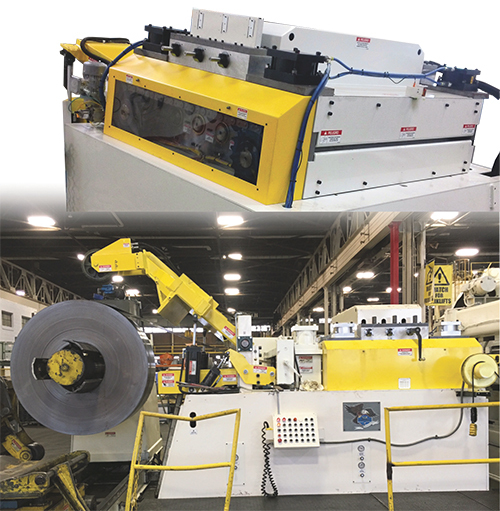 Now these materials are making their way into many Tier Two and Tier Three stamping plants. In many cases, just replacing the top half of the straightener is all that’s needed to equip an existing coil-feed line to reliably feed AHSS. This includes, as illustrated here, a new head with the structural design and component content able to deliver the force needed for the application. Changing out components in the straightener involves, typically, use of smaller-diameter straightening rolls than those typically specified for shaping mild steels, and use of tighter center distances. The gearing also typically is upgraded. Compared to earlier times, when metalformers dealt primarily with steels in the yield-strength range peaking at around 50,000 psi, working with steels in the 100,000-psi or greater range requires an entirely new and unique set of equipment. And, the first step in the AHSS-forming process is perhaps the most challenging: straightening. To gain an understanding of the severity of this specific challenge, and for an update on how technology is evolving to support the stamping community, we spoke with representatives from Coe Press Equipment Corp., Sterling Heights, MI. It all starts with calculating the forces needed to bend and straighten these higher-strength materials as they feed from coil through the feed line to the press. The software utilities Grant describes can determine these forces based on material properties and coil width, with the goal of removing coil set and cross bow. Software utilities can simulate roll deflection under load. A conventional straightener (left) exhibits 0.049-in. deflection with 60,000 lb. of force applied, while the rolls in a straightener designed for AHSS deflect only 0.007 in. 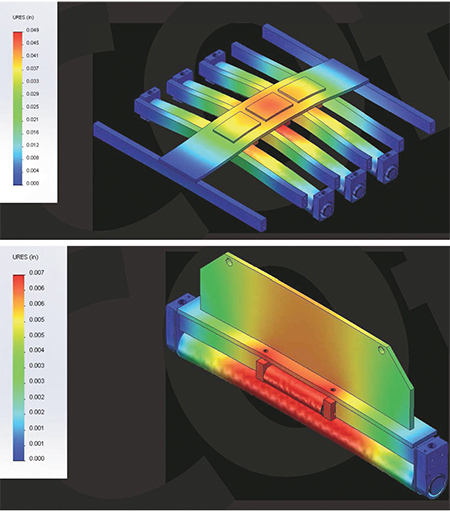 What’s the impact of increasing material yield strength from, for example, 50 ksi to 90 ksi? According to Grant, such an increase results in an 81-percent increase in the amount of force required, along with a 67-percent increase in required horsepower and 63-percent increase in pinch-roll gear torque. “Roll deflection in these high-force applications is a primary concern,” adds Coe engineering manager Jim Ward. “We see in many cases that the older equipment used by stampers generally lacks the force delivery to the work rolls needed to adequately bend AHSS material. Or, while the straightener may be able to apply the force needed, it won’t have sufficient roll support. As a result, the rolls deflect under load and induce edge wave into the sheet. This seemingly dire situation, however, is coming to an end, as suppliers get a handle on how to meet the challenges posed by forming AHSS sheet. They’re developing the science needed to overcome the challenges posed, as the “norm” goes from stamping 50-ksi steel to dealing with steels with yield strengths of 100 ksi or more. Suppliers are using FEA and other tools to develop new solutions, which Ward says typically fall into one of two categories. “We see stampers looking either at total coil-line replacement in order to solve reliability issues when stamping AHSS, or just retrofitting the straightener of an existing line,” he says. Total coil-line replacement, including equipment for coil containment and threading, requires an entirely different business case for justification than does a straightener retrofit. However, in many cases, say Ward and Grant, just replacing the top half of the straightener suffices, to equip an existing coil-feed line to reliably feed AHSS. This includes a new head with the structural design and component content able to deliver the force needed for the application. Using the aforementioned software utilities, the stamper can be assured that the retrofitted straightener will be able to sufficiently backbend the material and apply the required roll-depth penetration. And, there’s assurance that the machine will have the required rigidity and structural integrity. Changing out components in the straightener often involves use of smaller-diameter straightening rolls than those typically specified for shaping mild steels, and use of tighter center distances to improve force transfer to the material. The gearing typically is upgraded to handle the increased forces and torque. So, what should stampers look for, and ask for, when approaching equipment providers for help upgrading their operations to handle AHSS and other high-strength materials? Other utilities illustrate for the stamper the required straightener-roll settings for a given material type and coil width, and can specify threading-drive size, holddown force, drag-brake tension requirements and more. “Tough times require new tools,” Grant says, summarizing his thoughts on the new challenges stampers face due to the onslaught of higher-strength materials. “New software tools allow suppliers to simulate for customers how upgraded equipment, designed to handle these new materials, will perform on the shop floor before equipment is purchased. And we can show them how changes in process variables will affect the outcome.